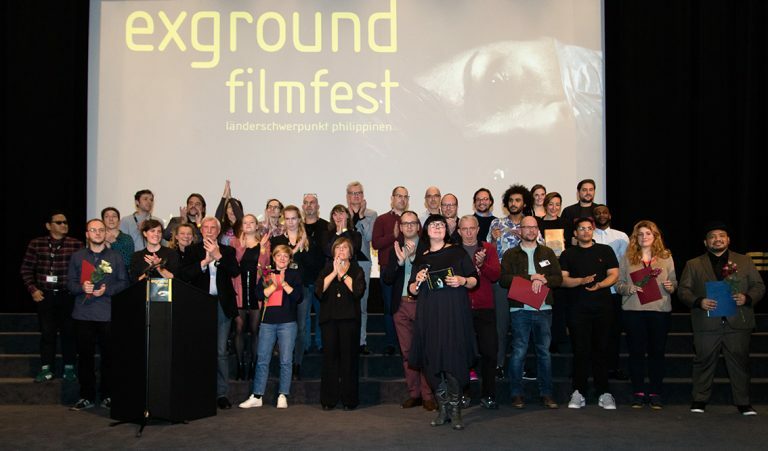 exground filmfest 31 celebrated its grand finale at its annual awards ceremony yesterday evening at Wiesbaden’s Caligari FilmBühne after presenting ten days of compelling independent cinema. Following the German Short Film Competition screening, cash and non-cash prizes valued at roughly 20,000 euros in total were awarded in the scope of seven competitions. The over 100 film industry guests from Germany and abroad in attendance and high audience turnout proved once again that the tradition-rich festival continues to be very popular both within the region and far beyond the city limits of Wiesbaden. Following the screening of the entries to the German Short Film Competition, the audience voted for their favourites, ultimately choosing Pola Beck’s KLEPTOMAMI as the winning film. This year’s first prize, endowed with a cash prize of 3,000 euros, was once again sponsored by the State Capital of Wiesbaden. Second place went to RIEN NE VA PLUS by Sophie Linnenbaum, who receives a cash prize of 2,000 euros, sponsored by Wiesbaden’s Magenta TV Fernsehproduktionsgesellschaft. Kiana Naghshineh was honoured with third prize (including 1,000 euros, sponsored by the State Capital of Wiesbaden) for A BLINK OF AN EYE. Pola Beck’s KLEPTOMAMI also received both non-cash prizes: a film equipment rental package valued at 2,000 euros from Pille Filmgeräteverleih for her next film as well as the grading special package from Magenta TV Fernsehproduktionsgesellschaft valued at 1,500 euros. The award is endowed with a cash prize of 1,500 euros, sponsored by “Die WERFT – Kulturbühne in der JVA Wiesbaden”, a cultural platform operating in Wiesbaden’s main correctional facility. The cash prize of 2,500 euros accompanying the award was sponsored by the State Capital of Wiesbaden. The youth jury also chose SOMETHING ABOUT ALEX [ANDERS] by Reinout Hellenthal as best short film at exground youth days. The honour includes a cash prize of 500 euros for the first time this year, sponsored by Wiesbadener Kinofestival e. V.
The audience chose Wanuri Kahiu’s RAFIKI as best feature-length film. The filmmaker receives a cash prize of 1,000 euros, sponsored by the State Capital of Wiesbaden. In the Wiesbaden Youth Film Competition, LESSON by Moritz Goebel and Joshua Kiefer came out on top in the audience voting. First place includes a cash prize of 500 euros, sponsored by the Hessian State Centre for Civic Education. Second place went to ALLES MUSS MAN SELBER MACHEN by the team JAJEMoRF, who will receive a gift certificate worth 150 euros from the certified Apple dealer ergo sum. In the audience competition for Wiesbaden’s best short film, HAYTHAM by Peter Ederer and Arne Dechow was able to win over the viewers. In addition to a cash prize of 500 euros, sponsored by festival media partner Wiesbadener Kurier, the winners will also receive the “Film Sound Special” non-cash prize package, which entitles them to take advantage of the tools and know-how of the Wiesbaden audio production studio klangBezirk for two days for the final sound mix of their next film, a package valued at 2,000 euros. Trash is cult – the participants in this year’s legendary exground Gong Show proved it once again. The well-earned winner of the cash prize of 50 euros and the Golden exground Cucumber is Jet Leyco, who shot his WOMEN OF WIESBADEN in Wiesbaden on the day of the Gong Show. Save the date for exground filmfest 32, taking place from 15 to 24 November 2019!